Trine 3: The Artifacts of Power is notorious for a few things. The first is that it radically changed the gameplay style from its predecessors, segmenting the fan base in the process. The other is that the relative failure of the game nearly bankrupted developer Frozenbyte. Costing roughly three times as much as Trine 2, the polarizing reception and lack of sales left the future of the series up in the air. After working on a few smaller projects in the interim, Frozenbyte announced late last year that Trine 4 was finally happening. Returning the series to its 2.5D roots, the game would be a continuation of what fans found so endearing about the original duo of titles. All of the physics-based puzzles and co-op shenanigans would be present as well as a new four-player co-op option. This title sounds like a real winner on paper. 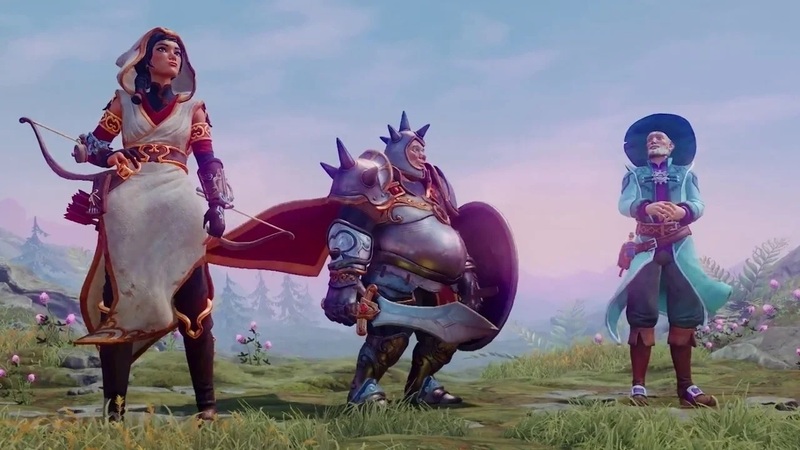 I recently got to sit down with Frozenbyte's vice president Joel Kinnunen and marketing manager Kai Tuovinen to see the first gameplay reveal of Trine 4. As well as getting caught up on how it looks and plays, I was able to ask a few things with regards to how Trine 3's failure shaped the development of this new entry. It seems all the backlash has been taken to heart, as both guys repeatedly stated they looked at what made the original games so good in the first place. The demo started with a short level introducing Pontius' abilities. Anyone familiar with the series will be happy to see the portly warrior hasn't undergone a radical redesign but retained all of his charm and animations. He still swings a sword and carries a shield with the ability to reflect projectiles back and shoulder rush opponents or objects. This all plays into various puzzles, of which I saw Pontius redirect an enemy blast into some bramble to cause a light shaft to beam onto a foe. It might be a little basic, but it was created specifically for demonstration purposes. Next, the devs went a bit further ahead in the story to show off cooperative gameplay and more abilities. Sticking with Zoya and Amadeus, the duo utilized some cool tricks where one player would conjure a box, the other would shoot a string arrow to it, and they'd have a makeshift bridge to clear some gaps. A new ability Amadeus has is that of creating circular objects, which the player can then balance on to cross areas filled with spikes. Just like previous Trine games, cooperative play is seamless. Anyone can drop in and out as they please and players with less than three can swap to whichever hero they need to with a press of the shoulder buttons. The new four-player option wasn't shown off, but the fourth player is given the choice of being any of the three heroes. 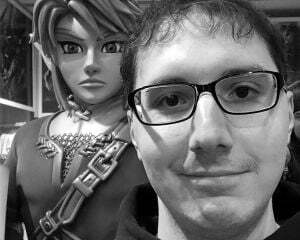 This was added in response to some fans saying they wished to include an extra friend in the action and to play up the fact that this game is called Trine 4. While going through another puzzle, Tuovinen mentioned that the puzzles in Trine 4 are all based on whether you're playing in co-op or not. There is an entirely separate journey for solo players, with the game swapping out puzzles to more complex ones should another player jump in. 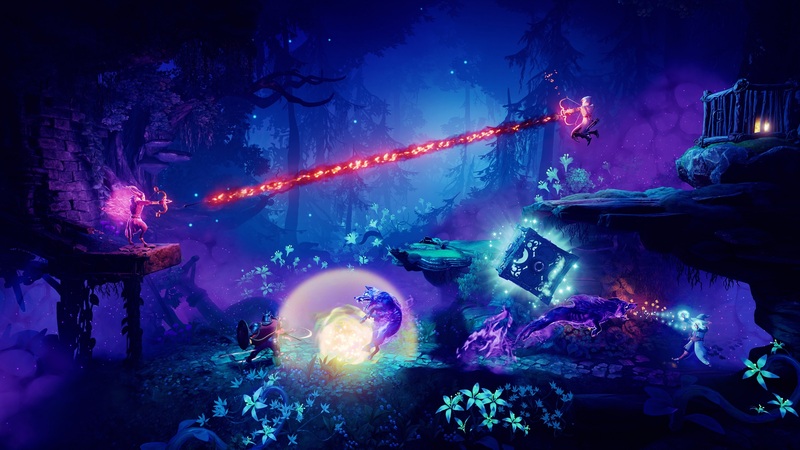 Frozenbyte wanted to give more replayability to Trine 4 without simply tacking on extra levels to the whole thing. Tuovinen and Kinnunen said this in a room that required the use of all three character's abilities. The puzzle could be described as a mirror, with the environment organically explaining how to solve the other side of the room. There was a ball attached to a string that needed to be swung into some trees to clear a path for a locked door. The other side of the room had the key hidden behind some boxes but with seemingly nothing to clear them. The solution required Amadeus to conjure a ball, Zoya to string the ball to a hook, and Pontius to rush it and swing the thing upwards. It wasn't elaborate, but again, this was an early level meant to gradually introduce the different mechanics at play. I then questioned if multiple solutions were available, which led directly into the next room. The intended solution for this next puzzle was for Zoya to move a trap door and freeze it, then have Amadeus conjure a block and allow another player to jump up and pull a switch. Wanting to look fancy, Tuovinen and Kinnunen made Pontius deflect Zoya's arrows to trigger the switch without jumping up. Funnily enough, neither member actually knew about the arrow deflecting until a few days prior. Some of the other devs decided to tinker with player abilities in fancy ways and added a physics modifier to Pontius' shield. The goal was to let players interpret solutions as they see fit instead of designing everything in a rigid manner. That follows through in a lot of the puzzles present. Occam's razor certainly applies to most scenarios, but sometimes you just want to bend the rules. Maybe swinging like Tarzan is fun, but if you can string a 2x4 to a chain and ride it like an elevator, doesn't that provide the same result? 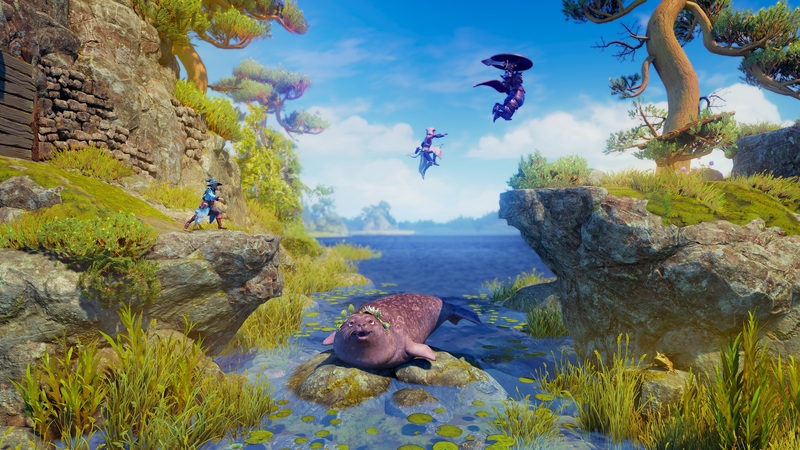 It seems like there will be a ton of fun in figuring out the multitude of ways in which you can navigate the environments in Trine 4, which is certain to please fans of the original titles. Before leaving, I wanted to ask why Trine 4 was going back to a 2.5D style. Was it really all down to that negative reception, or was something else at play? "It's part of it, yeah. We kind of looked at what makes a good Trine game and found that the games just play better in the side-scrolling style," Tuovinen said. 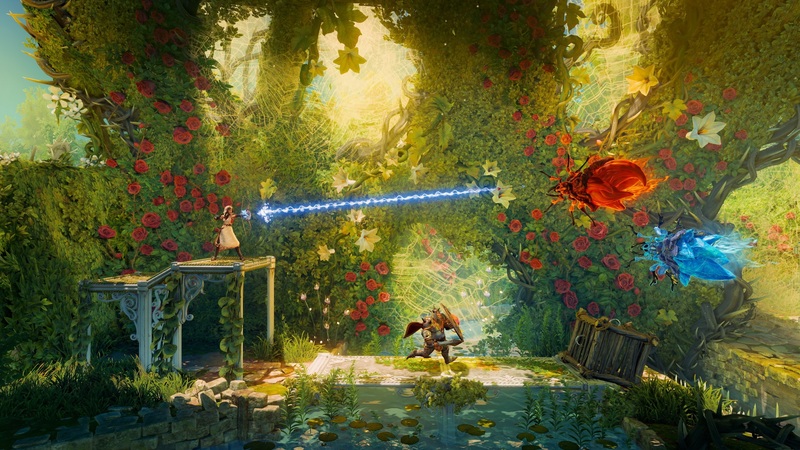 "It's a combination of that and fans asking, 'Why don't you make a 2.5D styled Trine?' Since it was time to make a new one, we thought how can we make the best Trine game, the most complete one." 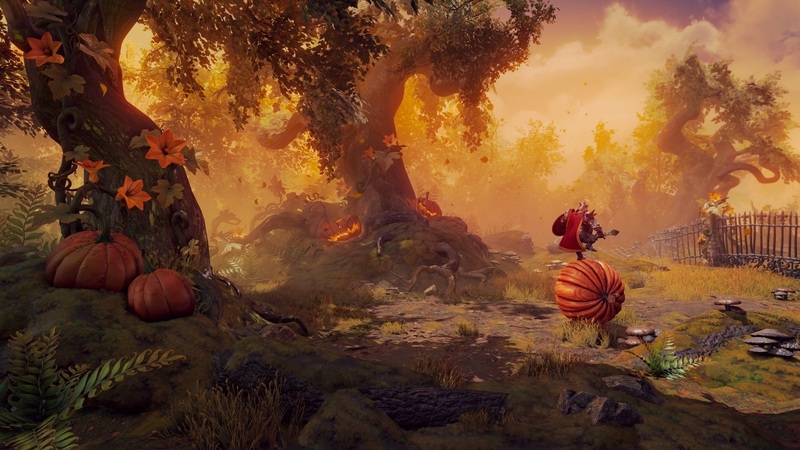 Kinnunen added, "We wanted to combine the best elements from the previous games to make Trine 4." I was also curious if the potential bankruptcy had made the team want to distance itself from Trine for a while. Kinnunen stated, "It was tough, at times. It took us a while and we didn't want anything to do with Trine for a time. We slowly got the energy back and started getting into the rhythm of building games before deciding, 'We'll make another Trine game.'" Tuovinen echoed that sentiment, saying, "What helped was releasing three games in between." Taking a four-year hiatus refreshed the team and allowed them to hone in on what Trine is all about. It was a bold move to shift Trine 3 into the third-dimension and while that game failed, the lessons gained seem to have put Trine 4 on the right path. Everything I saw looked like exactly what I remember about the series, having wonderful visuals and inventive physics-based puzzles. Trine 4 might not be reinventing the wheel, but it also isn't arbitrarily changing it. Trine 4: The Nightmare Prince will launch this fall for PC, PS4, Xbox One, and Switch. Players that aren't caught up with the series will be able to nab a complete collection and dive into the previous entries with little fuss. This will release alongside 4 in the fall.